Phillies Nation invaded Cooperstown’s Baseball Hall of Fame and Museum over the weekend. Wasn’t quite the sea of red when Ashburn and Schmitty were inducted in 1995. But, Phillies gear was dominant in the village and Hall’s museum. The Hall of Fame saluted the Phillies, the first time they have ever dedicated a weekend to a World Champion. The World Series trophy was on display Saturday and Sunday, bringing down the curtain on a six-month journey. It was fitting that the final public tour would take place in Cooperstown. In addition to the trophy, special tours were held for Phillies fans. Noah Becker, one of the Hall’s interns, was one of the tour guides. He grew up a Phillies fan in Wayne, PA, and did a terrific job during the 45-minute tour that included Phillies history and history of baseball in Philadelphia. His enthusiasm matched that of the Phillies faithful. On Saturday afternoon, my wife and I were privileged to represent the Phillies and present a World Series ring to the Hall, a long-time tradition. The presentation took place in front of the Autumn Glory exhibit (2008 World Series). The ceremony came at the end of Becker’s 10 a.m. tour. Bill Hasse, Sr. VP, received the ring. During and after the ceremony, Phillies faithful couldn’t take enough close-up photos of the ring. Glad my fingernails were clean. My wife was wearing a WS pendant and she became the subject of more photos than the winner of Top Model. Fans with their cameras, cell phone cameras and video cameras swarmed around the trophy the entire weekend. Fans were so enthused to see the trophy and the ring. You could feel their sincerely, excitement and pride in being a Phillies fan. MLB Production’s World Series video was shown several times in the Bullpen Theater. It was cool knowing the ending. Phillies Trivia sessions were scheduled in the same Theater twice each day. I chose to pass. Didn’t want to flunk and be embarrassed. Games for kids were held there once each day. I wanted to sneak in but couldn’t pass for being a kid. While wondering through the Plaque Gallery, I noticed a man who looked like Paul Byrd, former Phillies pitcher (1998-2000). I wasn’t sure but decided to ask. Yep, it was Paul. He, his wife Kym and sons Grayson and Colby were in Cooperstown for the weekend. Youth baseball programs are held at the Cooperstown Sports Dream complex east of the village. Grayson was playing baseball there in a 12-year-old tournament. The complex includes 30 baseball fields. While the team is finishing up a road trip over the weekend, the World Series Trophy Tour is finishing up a six-month journey. Idea was to let as many fans as possible see the prized trophy. Tonight, it is on display at the Wilmington Blue Rocks game. Friday night, at the Williamsport Crosscutters game and this weekend, in Cooperstown as part of Phillies Weekend at the Baseball Hall of Fame and Museum. The trophy will be on display in the Museum’s Plaque Gallery from 9 a.m. to 5 p.m. on Saturday and Sunday. Saturday’s events include the presentation of a World Series ring to the Hall of Fame, a tradition. I have that honor. Saturday is eight months to the day when we clinched the World Series championship at Citizens Bank Park. Only fitting that the tour ends in Cooperstown. Ruben Amaro Jr. talked about the lack of pitching being available, a commodity we and many other clubs are looking for. Nineteen clubs are within six games of postseason play. Trading deadline is July 31. Reading outfielder Michael Taylor’s streak of homering in three straight games ended last night. The 23-year-old had three hits to boost his season average to .340, third in the Eastern League. RHP Kyle Drabek (Team US) LHP Yohan Flande (World Team) will participate in the 11th annual XM All-Star Futures Game in St.Louis the Sunday before the July 14 All-Star Game. Next post is Monday for both the blog and twitter. We win on the road, lose at home. So, from now on the players will have to live in a hotel in Philadelphia. A bus will be provided to and from the park, just as life on the road. Now, if we can only get MLB to let us bat first at Citizens Bank Park. Six-run outburst in the first allowed us to coast to a win for Jamie, his fifth. We’re the last team in the majors to have a pitcher reach five wins. We have the third-best record in the NL and still lead the East. That’s what counts..
J-Roll scored one of the six first-inning runs. We’re now 28-7 when he scores a run. When he doesn’t, 9-24. Lot of bloggers and blog commentators want him dropped in the batting order. Hey, he’s the leadoff hitter and should stay there. With three lefties starting this weekend in Toronto, Mayberry will get more playing time. Right-handers the next two nights means Howard/Dobbs/Stairs will get action somehow. Tomorrow night’s game will also be televised by the MLB Network, Matt Vasgersian, Joe Magrane and Mitch Williams. Game is subject to local black-out rules. Phillies Insider is also on Twitter (Barons63). Twitter. Being technologically limited, first time I heard that word I assumed it was a deranged, distant relative of Tweetie Bird. It is a network in which people can let you know what they are doing so you can let them know what you are doing. Why wasn’t I the first to think of that? Anyway, I’ve entered the twitter universe (barons63), thanks to free lessons from Mary Ann Gettis, our Coordinator of Marketing Initiatives. Her initiative was to teach an old dog a new technological trick. So, now I can bore you in two places, here and there. There are challenges. Here can be a longer bore, there a limited bore. Barons63 joins the Phillies twitter (philaphillies), which has a huge following, including Joe Bonsall, lead singer of the Oak Ridge Boys; Senator Arlen Specter, actor/comedian Jamie Kennedy and Chad Durbin. Todd Zolecki, Phillies beat writer on MLB.com, has been on twitter for some time. Hopefully, between the three twitters, Phillies fans will be well informed. Injuries are piling up for us and the Mets. A year ago, we had nine on the DL throughout the season: Lidge, Victorino, Rollins, Snelling, Werth, Gordon, Feliz, Seanez and Jenkins. None, however, were on the list at this time of the season. Now, we have Brad, Eyre, Myers, Raul and possibly Condrey. There are 135 players on the disabled list in the majors as of yesterday. Of that total, 74 are pitchers. Members of the Clearwater Threshers front office staff and the player development staffs of the Threshers and Gulf Coast League Phillies are receiving their World Series rings today. David Montgomery and Richard Deats made the trip to Florida with the team last night for the ring presentations in Clearwater and the three-game series against the Rays. Trip also includes checking out the construction progress of Carpenter Field. Old clubhouse was demolished and a new one is underway. More on that later. The MLB-Phillies schedule lists no game today, following one of the poorest homestands in our history. Todd Zolecki lists the seven worst homestands; I’ve lived through four of them. Notice, the word “lived.” So, don’t panic everyone. While there is no game, every player and every front office employee will be at Citizens Bank Park this evening for the annual Phillies Phestival to benefit ALS, a progressive neuromuscular disease. Since 1984, the Phillies have raised more than $10.2 million for the ALS Association, Greater Philadelphia Chapter’s patient services and research. Thanks go to the fans that have supported the organization’s effort to strike out ALS all these years. Phillies leave after the Phestival for St. Petersburg and the final six games of interleague play. We’re 2-4 at Tropicana Field in interleague history; 5-4 in Toronto’s Rogers Centre. Our 23-9 road record is the best in the majors. Ryan Howard will not be at the Phestival or on the team charter tonight. Hopefully, he can fly to Florida tomorrow. Everywhere the Phillies go on the road, their fans show up in large numbers. Will be interesting to see how many Phillies fans will be in St. Petersburg the next three nights. Before Ryan’s illness, the logical DHs were Matt or Dobber, from the left side; Mayberry Jr., from the right side. A lefty starts tomorrow night. IF Ryan is a no-go tomorrow night, who plays first? Dobbs, Bruntlett, Coste or the World Series home run bat of Blanton? In-stadium balloting ends Sunday, which means Phillies fans need to hit the internet to keep voting for their favorite Phillie. Someone questioned ballot stuffing. Everyone should be aware that MLB issues the same number of paper ballots to each of the 30 clubs. Each club also gets 25 voting dates. So, we didn’t get more ballots or fewer ballots than other clubs. Our final shipment will go to the voting headquarters tomorrow. Online voting ends at 11:59 p.m., July 2. 25 times is the most one fan can vote. Chase and Raul continue to lead at their respective positions. Chase has fallen behind Pujols for the most NL votes. He pretty well sums up the present situation, a 5-game losing streak at home. Last time we lost 5 in a row at Citizens Bank Park: almost to the day a year ago, June 17-18-20-21-22. Red Sox won the first two, Angels, last three. Perhaps we should petition MLB not to schedule A. L. teams at home in June. MLB Network will air part two of the series on our bullpen at 9 tonight . . . Network will also carry our game in St. Petersburg on Thursday night. Simply put, the Blue Jays swept us because they played better: hitting, pitching, fielding. We’re in one of the valleys that are part of a baseball marathon. Madson’s game-losing homer was the first dinger he’s given up this year and the second in regular season play in his last 48 games. Stuff happens. We’re in Toronto next weekend so let’s see if we can rev up the revenge machine. Baltimore comes to town as interleague play continues. Three more sellouts. Orioles have the poorest road record in the A. L. (8-20) but are fresh from taking two in a row from the Mets at home, which was appreciated. Trades come at all times of the year, month or day. Twenty years ago today GM Lee Thomas pulled off TWO trades in ONE day, BOTH after a Sunday afternoon game at the Vet. **Juan Samuel to the Mets for Lenny Dykstra, Roger McDowell and a PTBNL (player to be named later). **Steve Bedrosian and a PTBNL to the Giants for Dennis Cook, Terry Mulholland and Charlie Hayes. Transition for Lenny was easy. He had played for the Mets that afternoon. His equipment was carried from the visiting clubhouse to the Phillies clubhouse. 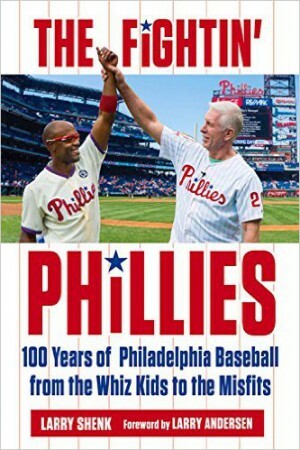 Charlie Manuel is featured in the current edition of Sports Illustrated, “They’ll Never Call You a Hayseed in This Town Again.” Mark Bechtel is the author. According to Philly papers, Charlie is close to going off on his struggling club. Congrats to manager Dusty Wathan and the Lakewood BlueClaws. 8-3 win last night at Hagerstown clinched the South Atlantic League Northern Division first-half title. Other time Lakewood was in the playoffs was three years ago. The BlueClaws won the second half title that season and went on to win the SAL championship. Roy Halladay, perhaps the best pitcher in the American League, was scheduled to start in this series but an ailment took him out of the present rotation. Toronto won the first two games behind rookie pitchers. All the two rookies did was strike out 20 in 15 innings while they were on the mound. Well, we face another rookie this afternoon, lefty Brad Mills. It is his major league debut. Rauuuul was placed on the DL and John Mayberry Jr. recalled from Lehigh Valley. Todd Zolecki has the complete story. We’ve signed 26 of the 49 players selected in the First-Year Player Draft last week. Among the top 10: #2, OF Kelly Dugan; #5, LHP Matthew Way of Washington State U.; #10, RHP Joshua Zeid, Tulane U. and #11, SS Nicholas Hernandez, U. of Tennessee. Deadline for signing players is August 15. Nick Leyva, Phillies manager in 1989-1991, is the third base coach for the Blue Jays. The Orioles are in town for three weekend games starting tomorrow night and Juan Samuel, another Phillies Alumnus (1983-1989), is their third base coach. Tuesday we begin three games in St. Petersburg. The Rays’ third base coach? Former Phillie Tom Foley (1985-86). The usual reliable bullpen wasn’t so reliable last night. Twice, we escaped a bases-loaded situation without the Blue Jays scoring. The third time cost us as Madson walked in the tying run in the top of the ninth. It broke a 14 scoreless inning streak by the reliever. Madson’s game-tying walk was one of eight by the bullpen. That many walks will bite you. With his 10th homer, Werth became the fourth Phillie to reach double-digits. We’re the first team in the N. L. to do that. Other than his two-run homer, the offense produced only one other run. Lack of hitting at home continues to be a puzzle. Before last night, .273 on the road; .252 at home. Perhaps we should wear our gray road uniforms at Citizens Bank Park. Then again, we tried that on June 10, 1972, at the Vet, blue road uniforms against Atlanta. Brilliant idea, terrible outcome: 15-3, Braves win. Fans can take photos of the World Series trophy prior to every Citizens Bank Park game. The road show will slow down when the end of this month comes around. For those of you in the Philly area, the trophy will appear this Saturday through the Philadelphia Athletics Historical Society. 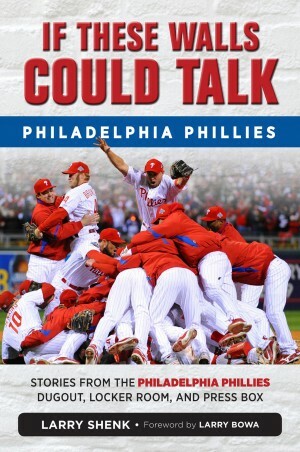 June 27-28 it will be in Cooperstown, NY, for a special Phillies World Series weekend at the Baseball Hall of Fame. “Take The Trophy to Work Day“, a promotion with Comcast SportsNet, has drawn nearly 12,000 entries. Registration deadline is June 26. LHP Yohan Flande and OF Stephen Susdorf are the minor league players of the week for June 8-14 . . . OF Michael Taylor continues to put up impressive numbers with the bat with the Reading Phillies. Defensively, he gets high grades, too. Harrisburg manager John Stearns says Taylor has the best outfield arm he’s seen since Ellis Valentine . . . Lakewood BlueClaws’ magic number for clinching the North Division first-half title is two going into tonight at Hagerstown. Players received their World Series rings first, as they should, in pre-game ceremonies back on April 8. Front office staff receives their rings on the field after tomorrow’s Citizens Bank Park Businessperson’s 1:05 p.m. game. Should be exciting. In spring training, we and the Blue Jays are neighbors. Clearwater is our home and Toronto trains in Dunedin, about 5 minutes north. We’ve played a ton of spring training games against the Blue Jays. That doesn’t include the world-famous “B” games. Toronto begins a three-game Citizens Bank Park visit tonight. There are still tickets available for tonight and tomorrow but Thursday’s Citizens Bank Businessperson’s Special is sold out. In 24 previous interleague games, the slate is even, 12-12. At Citizens Bank Park, same story, 3-3. Two years ago here some guy named Matt Stairs homered in each game for the Blue Jays. Toronto’s three games over .500 but scuffling. They’ve dropped four straight and are 0-6 against the N. L. (Braves and Marlins). Blue Jays lead the majors with 633 hits and 145 doubles. Defensively, a stingy 26 errors, two more than us. ESPN tomorrow night but blocked out in the Philadelphia area. Phillies are third in the N. L. in total attendance (1,266,090) and first in average (43,658). In addition to packing ’em in Citizens Bank Park, tours of the Phillies home are booming. We’ve just went over the 75,000 mark since the park opened in 2004. Information on tours: phillies.com or the phone center (215 463-1000). Pretty much the same, 41-30, first place, three games up.